Waterproof, full coverage, high-performance, no budge NUTRATANICALS Antioxidant Foundation gives you a natural, moist-looking simply flawless finish. Moisture in a powder? Yes! Infused with Japanese Honeysuckle you get the benefits of this ancient secret ingredient to give your skin moisture and luminosity. This formula contains only 5 ingredients including an all-natural Plantservative. 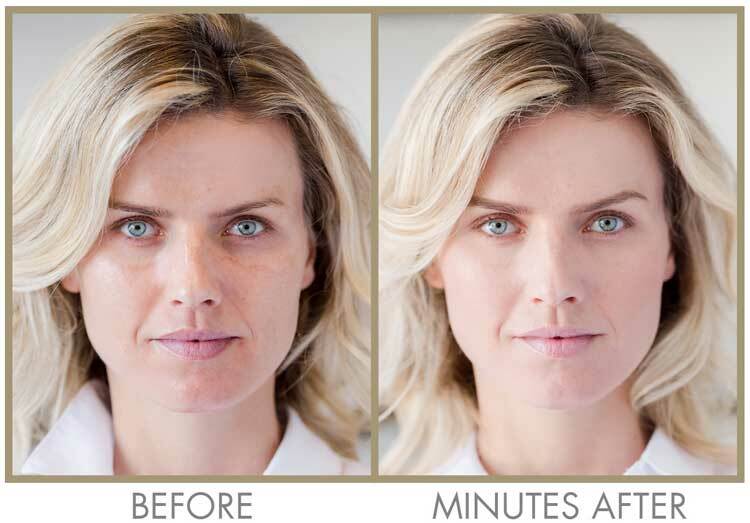 Instantly blend away the look of age spots, uneven skintone, hyper-pigmentation and blemishes with a luminous finish. Jojoba and vitamin E makes sure you skin never feels or looks dry – it actually improves the moisture, texture and tone of your skin. 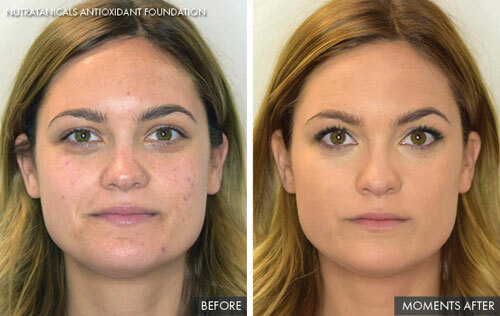 Feeling like a cream, GENIE Nutratanicals Full-coverage Antioxidant Foundation is a non-drying formula that will not emphasize large pore, cake or settle into fine lines and wrinkles. GENIE Nutratanicals Full-coverage Antioxidant Foundation is perfect for use over Genie Instant Line Smoother. Available in 8 natural-looking shades. GENIE Nutratanicals Full-coverage Antioxidant Foundation formulation does not include parabens, silicone, alcohol or fragrance. Invisible coverage – evens out your skin tone “invisibly” gives you complete coverage. Never feels or looks dry – improves the moisture, texture and tone of your skin. HYDRATING, Lightweight Yet Natural – feels like a liquid. You control the coverage level you desire. Non-drying formula will not cake or settle into fine lines and wrinkles. Japanese Honeysuckle – this ancient natural botanical is anti-inflammatory, anti-bacterial and adds moisture for super hydration to your skin. Jojoba – nourishing botanical provides suppleness from essential fatty acids and antioxidants to your skin. Shhhh… One of the secret ingredients is Japanese Honeysuckle Extract. Not only is Japanese Honeysuckle Extract 50X more expensive than typical mineral make-up ingredients, it’s what makes GENIE Nutratanical Foundation so smooth, creamy and line-smoothing. What makes NUTRATANICALS Antioxidant Foundation extremely unique? The key ingredient, Japanese Honeysuckle offers so many benefits such as crease control, moisture, longevity, skin calming and more. You will feel and see the difference instantly! What if I want added coverage for a special event? 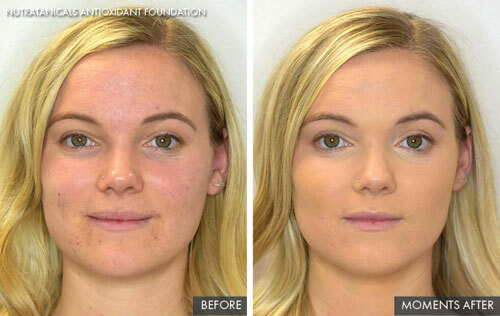 NUTRATANICALS Antioxidant Foundation can be layered for more coverage. The small particles layer ON the skin with NO line or crease settling! Is there any shine or sparkle to NUTRATANICALS Antioxidant Foundation? No shiny finish. 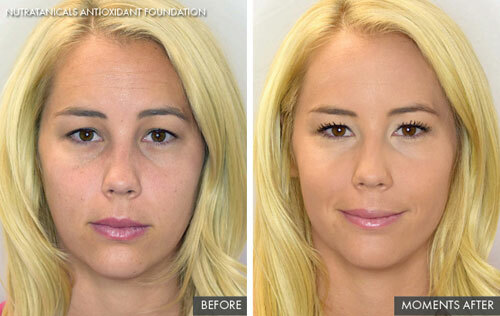 The results are natural and accent your beautiful skin. Do I need to use sun protection when I wear NUTRATANICALS Antioxidant Foundation? NO. 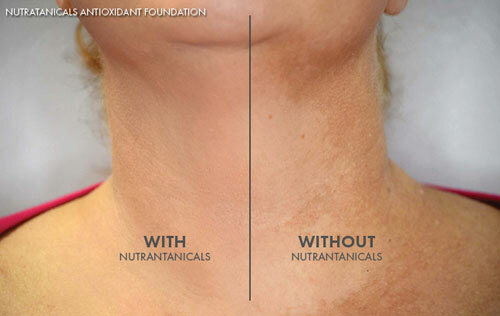 NUTRATANICALS Antioxidant Foundation has a 15 SPF to protect from the sun and premature aging. Tap a small amount of NUTRATANICALS Antioxidant Foundation into the lid. Pat GENIE Kabuki Brush in the lid to load brush and then tap the blunt end of GENIE Kabuki Brush on counter to disperse evenly. Gently brush & blend onto skin. Repeat until desired finish is achieved. Love it! This Product is Fantastic! “I find it hard to find good foundation and was skeptical of mineral powders. Powders always remind me of my granny. However, I absolutely love this and immediately got compliments on my skin. I just lightly dust it over my face, not applying too much, and my skin not only evens out, it glows. By far my MOST FAVORITE FOUNDATION EVER!! I’ve tried just about every power/mineral foundation there is and they were either a shade off or looked chalky/dry on my skin…always leaving me with my olive complexion frustrated. When GENIE came out with this version of a foundation I was ready to give it a try especially reading about the hydrating effects of Japanese Honeysuckle YAY, it’s FANTASTIC! Medium Beige is my shade, GREAT COVERAGE, smooth texture, I couldn’t be happier. I’m always asked what I use or IF I have foundation on, at my age that makes me feel awesome!! Love this product! I call it a one-stop-shop for foundation and powder. The coverage is perfect, and the different colors are subtle but made to match just about any skin tone. And it really lasts all day–I put it on very early in the morning before work and never have to do a touch-up later. This is one of the best beauty products out there, and at a fraction of the cost of other brands. I also use many of the other Genie products and am really sold on this company!! Absolutely love! I’ve been using a powder from Sephora for years — but recently switched after being introduced to this brand and I am a total convert! Gives an effortless, natural look and feels great! I never considered using a powder foundation, but I got an introduction deal. I did not order the right shade the first time, but I loved the way it felt on my face enough to try again. Now I am very happy with my medium beige. 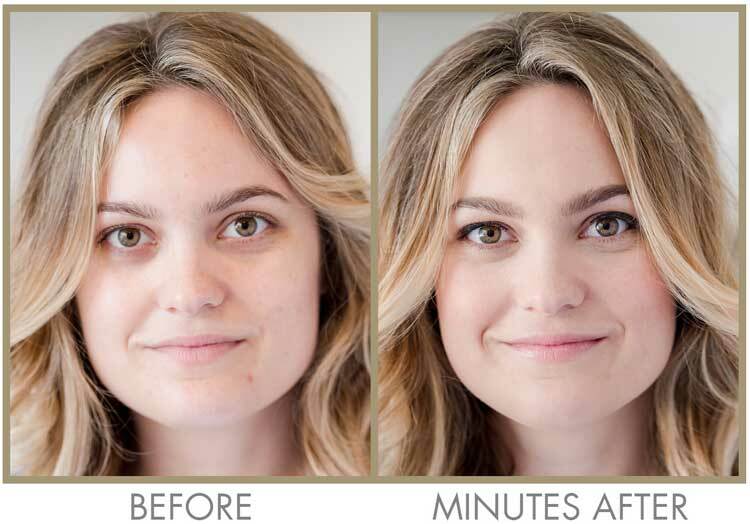 Combined with the Genie Concealer, I have the perfect way to quickly look great each morning. After months of use I noticed a big improvement in my skin as well. No more clogged pores! My sensitive skin is completely fine with this product. I am a convert. I love the coverage even though I tried just the sample, it covers better then my regular foundation. Very Nice! !